Includes core-technology UIMG, which is independently designed and manufactured by Newland Auto-ID. UIMG technology includes the optical, CMOS, digitizer, decoder, image processing & embedded systems. Through a 1D CCD or 1D/2D image engine with a RFID engine as an optional addition. 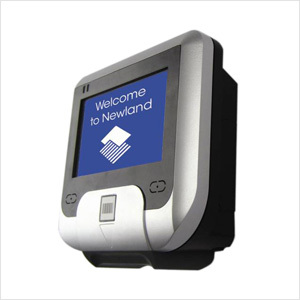 The external USB and GPIO ports enable the possibilities to attach a Newland hand-held scanner for controlling an entry/exit gate or door lock. Designer and ergonomic Information Terminal which can be used as, e.g. a Price Verifier/ Checker or Access Control terminal. 1D: Code128, EAN-13, EAN-8, Code 39, UPC-A, UPC-E, GS1 Databar, Codabar, Interleaved 2 of 5, China Post 25, ISBN/ISSN, Code93, etc. 2D: PDF417 , QR Code , Data Matrix , Aztec, Vericode , Chinese Sensible Code. The NQuire 200 complies with standard VESA 75 brackets enabling easy mounting on shelves and walls.